As part of our family photography sessions in Cache Valley, we include many groupings, but one of my favorites is the sibling pictures. More often than not, it's a bit of a challenge to get them to want to cooperate and put their arm around eachother (and at least do it without putting each other in a headlock), but the result is often my favorite from the whole family session. This photo in particular was especially rewarding. If it's not apparent by the picture, their family is very into the Scouting program. Both brother and sister were heavily involved in scouting. They both have worked at camps over the summers. 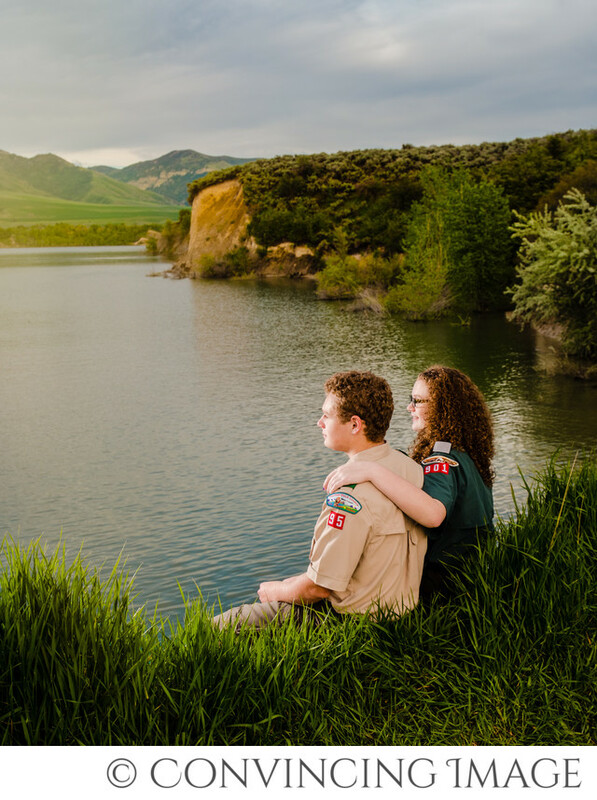 To create photo, first, we set the siblings on the edge of a hill overlooking Hyrum Dam. Easy enough. Then Julie (the wife part of the photography team) took the off camera flash and a soft box off to camera left, slightly downhill. Okay, I say slightly, but it was a steep hill, so it was more than slightly. How fun to stand on a steep hill, holding a light extended high in the air to get the little bit of a rim light on their faces. Pretty much every photo shoot, both of us (Nate and Julie) feel like we get a workout for the day. Between the lighting, the subject and the background, it was a lovely addition to their story and our portfolio.